cut and polished and sitting in a beautiful jewel box in a display case. Then someone will purchase it, and before long, it will become a dirty diamond once again. you get soap scum. In one short day, your brand new diamond could be dirty! sparkle. 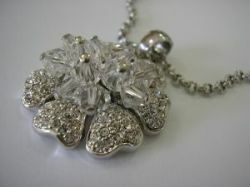 By taking one minute each day to clean your diamond jewelry, you can avoid this, and your diamonds will never be dirty!